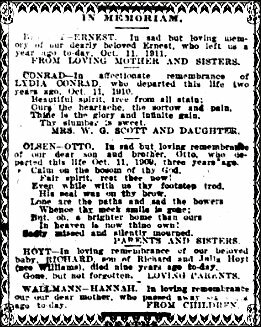 Do you think of a death notice as the last time your ancestor may appear in the newspaper? Think again! Probate and will notices aside, there may be memorial notices posted by grieving family members. While sad and touching, remembrances also provide clues for the family history researcher. How many years after death should a genealogist search? There is no hard and fast rule, but the Hoyt notice in today’s image may give you an idea. 10 and 20 year anniversaries are frequently recognized too. Family History Month is the perfect time to search for memoriams for your ancestors. It took over fifteen years for my 2x great grandfather’s estate to complete probate. The final notice appeared in the paper seventeen years later. I also found his name years afterwards in an article about the church he attended. One of those flashback type articles, it provided a lot of information about his religion that I was not previously aware of. I know, I am still going through all the probate records to make sure I have all the reports made to the court. In the last one, the executor mentions the report being his eighth and final….Oi! But there is a lot of good genealogical information in all the documents. I’m sure there is and you certainly want all of it. Good for you for being so thorough!